Seemingly undeterred by the recent outrage over tech giants' abusing their access to personal privacy, a recent patent filed by Amazon with the US Patent and Trademark Office (USPTO) has unveiled a new artificial intelligence system that could be embedded in an array of Amazon devices to analyze all audio in real time for specific words. Amazon calls the technology “Keyword Determinations From Conversational Data,” otherwise known as a ‘voice sniffer algorithm,’ and this could be the next giant leap towards expanding mass home surveillance of consumers' private lives. This pending patent application shows how Amazon could use consumers’ home data collected and stored on servers “to draw disturbing inferences about households, and how the company might use that data for financial gain,” said the Consumer Watchdog, a nonprofit advocacy group in Santa Monica, Calif. 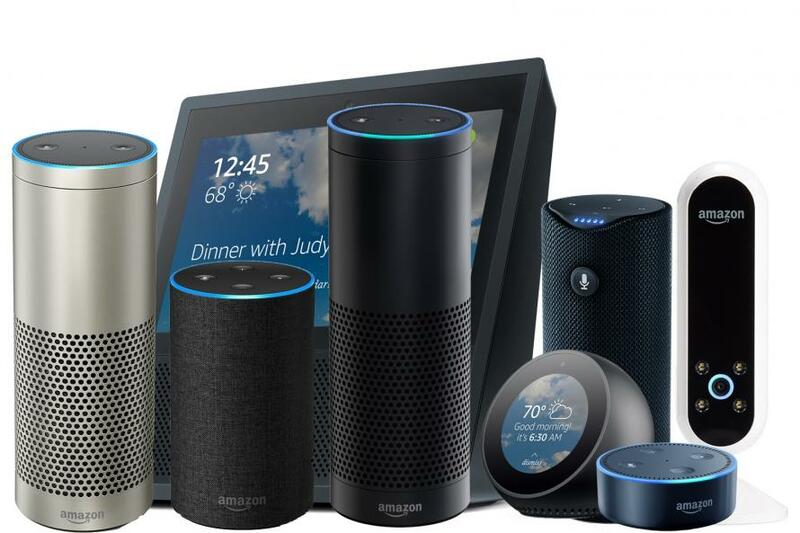 Currently, Amazon devices operate in a “listening” mode only and can be activated via user commands, such as “Alexa” or “Hello Alexa.” As far as we know, Amazon devices do not record conversations, as they only listen to commands after the user initiates a trigger word. However, within the foreseeable future, Amazon devices could record all conversations — even without a trigger word to wake up the device, along with creating a corporate profile of the end user for "commercial purposes." 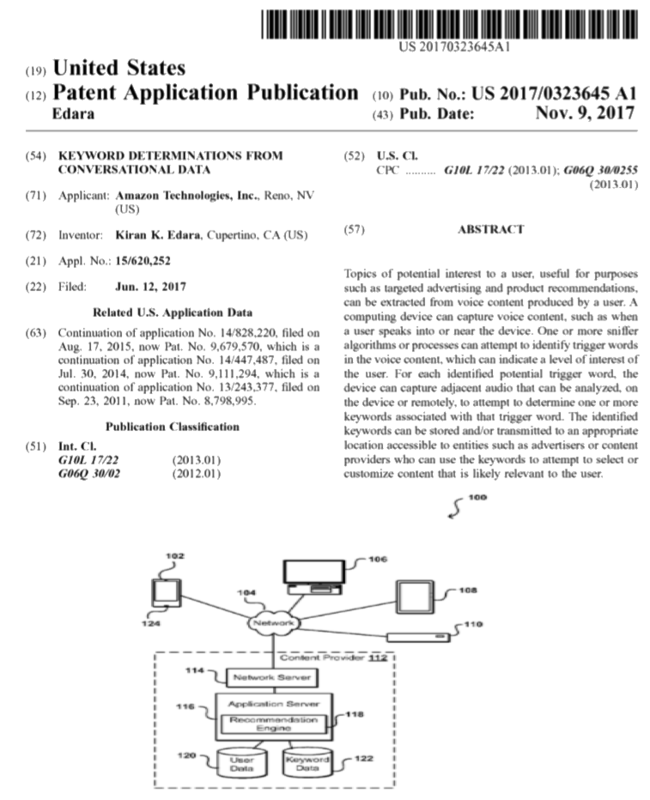 According to the patent, ”the identified keywords can be stored and/or transmitted to an appropriate location accessible to entities such as advertisers or content providers who can use the keywords to attempt to select or customize the content that is likely relevant to the user,” reports ABC News. ABC News does not mention, but we will throw this out there, government agencies could also acquire the data from Amazon. ABC News said the pending patent could even offer your private data to “friends of the user for gift buying” purposes. Nevertheless, the patent is pending, and there could still be a chance the USPTO does not approve it. Daniel Ives, a tech analyst with GBH Insights, indicates Alexa’s intelligence would rapidly increase if the pending patent was to be implemented in devices, because the algorithms would have unlimited reign on a consumer’s personal life. “This further builds on Alexa and more data intelligence and analysis through voice that is a major initiative for Amazon,” he said. “This algorithm would possibly feed from Alexa into the rest of the Amazon consumer flywheel, ultimately helping drive purchasing and buying behavior of Prime members. Ironic: Facebook's Mark Zuckerberg said the same thing before getting caught doing the opposite. So while Amazon's voice triggered devices offer some convenience, they also offer the corporate clients of Amazon unprecedented insight into the customers’ private lives, the same way when Facebook wins an ad contract, it is selling the client all of your personal information in the process. 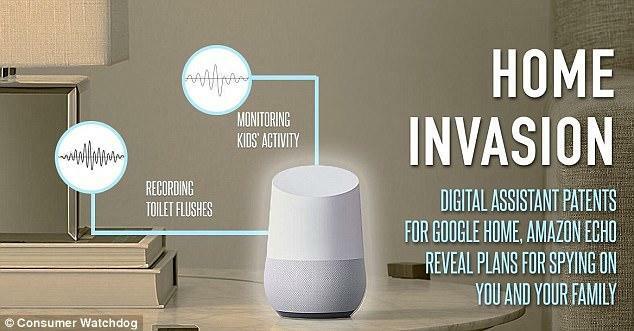 Meanwhile, unable to respond to this onslaught of in home eavesdropping, America finds itself in the latter stages of the disappearance of individual privacy. And with tech giants symbiotically linked to the US government, the Fourth Amendment is almost null and void, which with the ongoing crackdown against the 1st and 2nd amendments, will assure that in just a few years the corporate takeover of the country - whose residents which have voluntarily ceded over their most sacred rights - will be complete.